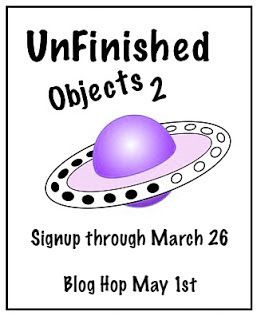 Karen Williams of Baublicious is hosting this UFO (UnFinished Object) Blog Hop. The point of the hop is to dig out some of those unfinished items (we all have them) stashed away and actually completed them. This is her second of these hops this year. I mentioned this hop when I shared some of the challenges ahead of me. I even showed some of the hidden UFOs I was contemplating working on. Now, it's reveal day. As admitted previously, I had several lengths of completed kumihimo that needed to turn into actual jewelry. I took a little time and one became a FINISHED bracelet! There wasn't much to this except to get the bead caps on the ends, add a clasp, and attach some chain to extend it a little. BAM! Done. Maybe I'll get to the rest before another 5 years passes me by. In addition, this collection of items I had been toting around was transformed. Instead of a jumble of bead supplies, it became an actual necklace. How about that? One whole side of the chain was completed. I just had to copy it for the other side then connect everything with jump rings. I don't know why I stalled out on this one. As well, I had these bits and pieces assembled in a baggie. The completion of it took a little longer as I had very little of the Vintaj Arte metal wire and something about the whole thing felt off. I finally decided it was the two gauges of wire. I had used 20g on the tarnished beads because of their large holes and 24g on the buttons because of the amount of wrapping that was involved. While that seemed perfectly reasonable, the result left something to be desired. Instead, I started anew with 22g hematite wire and replaced the tarnished beads with some metallic-looking e beads for a more cohesive result. As well, I only used that for the front section of the necklace and created the back with the e beads and gunmetal eye pins. Finally, I had a set of earrings on my desk that simply needed ear wires. I can't fathom what took me so long to slip those on them. 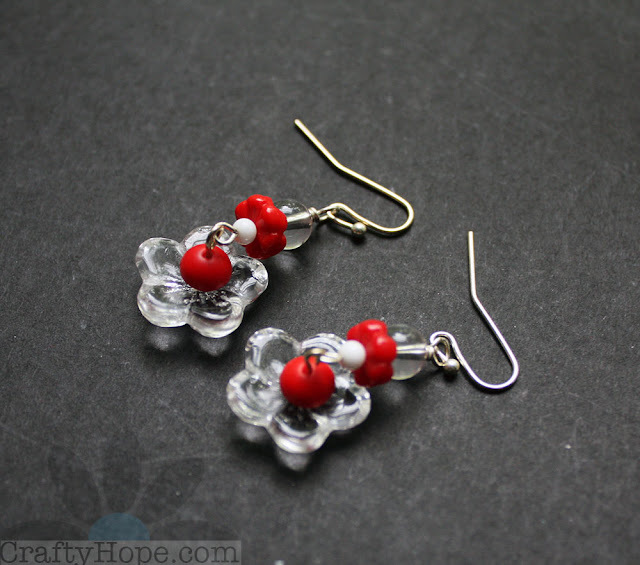 I'll add these to my growing pile of earrings from The 100 Day Project. But, since I didn't MAKE them as part of it, I won't be counting them. Oh, make sure to head over and enter my earring giveaway. That is, after you've checked out the rest of the UFO participants. I can't wait to see what everyone else was able to accomplish. And, it's such a relief to have a few of my own projects completed at last. Thanks to Karen for the opportunity to be a part of the hop and actually finish a few things!! Isn't it the truth that, once you actually pick them up to finish them, you can't understand why UFOs have languished for so long on the worktable? 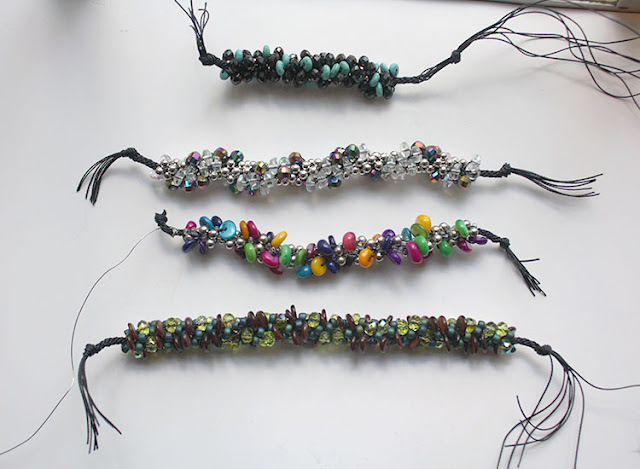 Your kumihimo bracelet is so colorful and fun - that will be a treat to wear all summer. And you found the perfect solution for the button necklace. It's no fun to cut apart finished work, but in this case the change of the wire gauges was exactly what was needed. As always, you made lovely things, and you made a big dent in your UFO pile! Yes! I think there comes a point where I just clean my desk of all the things and forget about anything that I put away. It's so funny how the simplest things are what's left to complete. I'm so glad you like the kumihimo bracelet and the button necklace. Now, I just need to find some momentum to finish the rest of the bits languishing in that stash! Thanks for the kind words and for popping by! Hope! You crushed the challenge!!! Isn't it funny how something ends up a UFO and all you really need to do is add some finishing!?!?! All the pieces you created here are beautiful! Hope - I love your phrase 'this collection of items I had been toting around was transformed'. That beautifully sums up the magic of what you do. 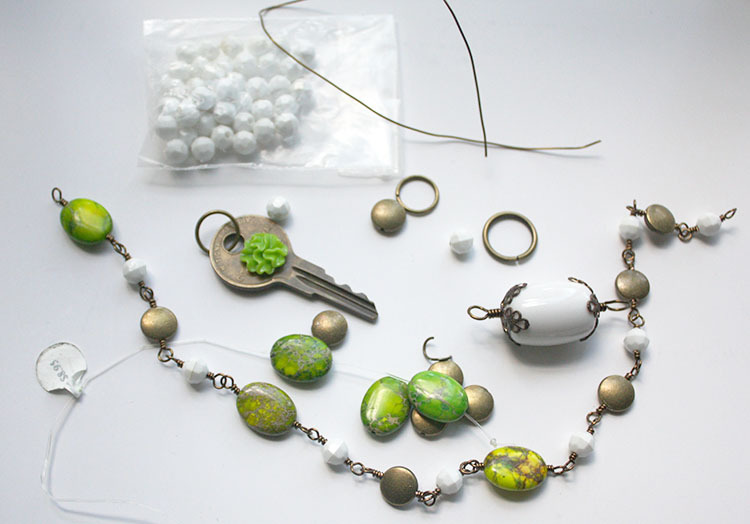 It's such fun to see your jumbled collections, then the beautiful jewelry you create from them. And I had to laugh with you regarding the earrings and the ear wires. Isn't it amazing how close we can sometimes come to finishing a project, and then it just stalls for some unknown reason, until something prompts us to go back and finish it up. The first bracelet looks like skittles. I love skittles. Both necklaces came out great. Your extra effort with the change in wire and substitution of e beads paid off! I really like that extra little chain you hung off the bottom, great touch. Skittles! Ha! Now I'll always see it as such. I'm so glad you like the necklaces too. They're definitely more me than the bracelet for sure Thank you! Love the colorful bracelet it's beautiful! Both of the necklaces are pretty cool too very Boho. The earrings are very pretty and the right colors for a Bama girl. Sometimes, I find it hard to finish an item, especially when it took more effort to put together. I have no idea why. And I know how rewarding it feels to do what you did - finish more than one! 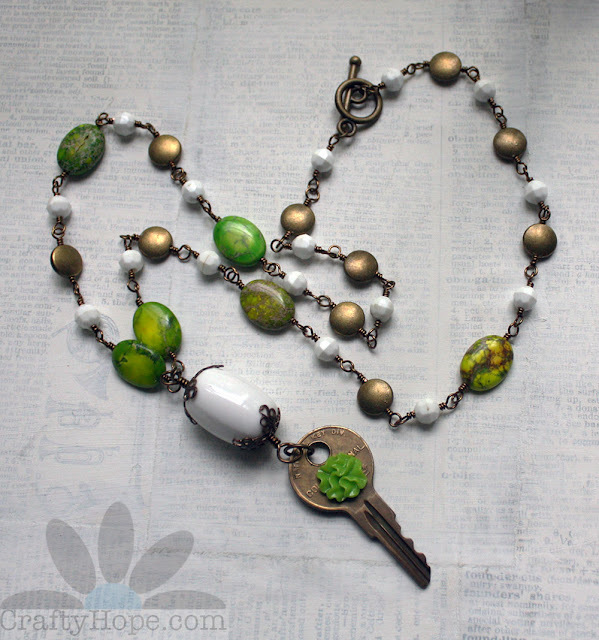 I love that necklace with the focal that looks like a found object. 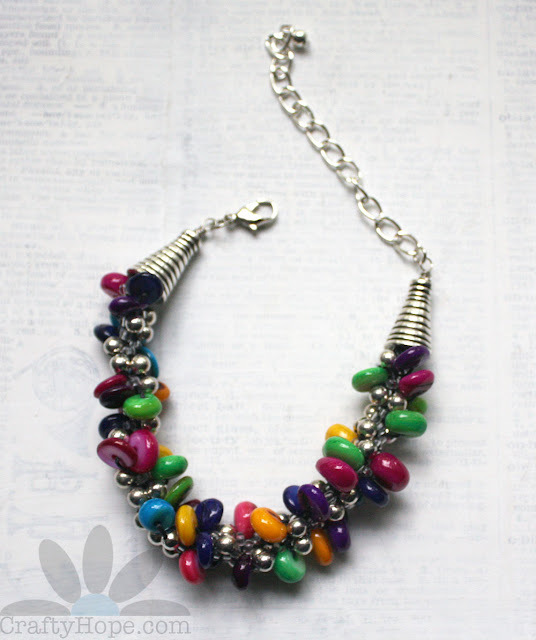 And I love the kumihimo bracelet - skittles, yeah! Wow! You accomplished quite a bit! I have the same problem with kumihimo. It's so fun to do, but I'm terrible at getting around to finishing it. I have a leather piece that just needs end caps and a clasp. I even have the end caps... Your bracelet turned out wonderfully. And I love your assortment of bits! 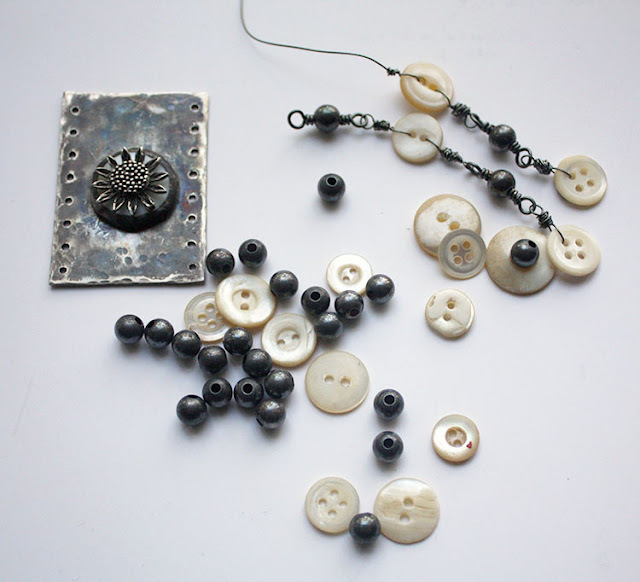 The metal focal on the button necklace is very cool. And I'm a sucker for anything with a key on it. You are inspiring me to make some custom link-y chain with beads. It looks great. Both necklaces are delightful. It only looks like I got a lot done. In that amount of time, I really should have finished more. But, it's been a crazy month! Yes about the kumihimo. It comes together so quickly and without much thought, but takes some attention to get it done. Glad I'm not the only one that just needs to wrap up the findings. So very glad I was able to inspire you with my own creations. It's the whole reason I continue to blog and share. Thank you so much for all your kind words. All your pieces are beautiful and I always am drawn to your style. The two pieces I like best are the bracelet - it is bright and fun. And that Button Necklace! There is something about the worn MOP buttons paired with that particular metal pendant that works so well ~ it really is a gorgeous necklace!